The first incarnation of Zokko! features a talking pinball machine which serves as the presenter and helps to link the various features together. With the pinball launched, it soon strikes a hit and the corresponding score indicates a particular feature by announcing, for example, “Zokko! Six!” before launching animated sci-fi serial Skayn. The first series is much more than just a helping of sci-fi as the myriad features include clips from Disney cartoons, endless children’s gags, guest performers such as Davies and Gray with their comedy dance routine and also a “thrill spot” which takes viewers on hair raising adventures via rides on the wall of death and water-skiing. 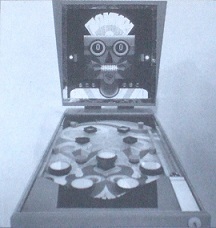 By the second series, the talking pinball machine has gone and the main links are provided from a studio featuring a collection of test tubes filled up with bubbling liquid. Although the pinball machine has departed, its electronic voice remains and presents similar features to the first series. This time round the fun includes another helping of serial Skayn and, once this has finished, new serial Susan Starr of the Circus, more Disney clips, specially produced music videos for contemporary songs such as Finchley Central by The New Vaudeville Band, groan inducing gags told over animations and performers appearing include Ali Bongo as the Sheik of Araby and The Tumblairs on their trusted trampoline. Zokko! was devised and produced by Molly Cox and Paul Ciani with 26 episodes making up the two series between 1968 – 70. Episodes lasted 20 minutes each and both series aired in the Saturday 12.25pm slot on BBC1. Speaking to the Daily Mirror in 1968, then BBC1 controller Paul Fox explained – with a side slice of contemporary sexism – that the show’s timeslot was the perfect way to keep the children busy whilst Mum prepared lunch. Although the first series of Zokko! was repeated in a Wednesday afternoon slot shortly afterwards, the second series was not afforded this luxury and has not been seen publically since its initial airing. Perhaps the most eye catching aspect of Zokko! was the talking pinball table which was designed by Mike Ellis – one of the parents of British entertainment being the father of Blue Peter presenter Janet Ellis and grandfather of pop star Sophie Ellis-Bextor. The voice of Ellis’ construction was provided by another linchpin of British culture in the form of Radiophonic Workshop’s Brian Hodgson who also engineered the distinctive TARDIS sound in Doctor Who and the Daleks’ modulated voices. Remaining in the audio world for a moment longer, Brian Fahey composed the brass heavy theme tune for Zokko! and this was later released as a single by Columbia Records. Unfortunately, as with so many TV shows of the era, Zokko! was almost, but not completely, wiped out of existence from the BBC archives. Although not quite having the gravitas of a Stalinist purge, it had a devastating effect on the long term legacy of Zokko! as only two episodes of the final series remain in the archives and, for now, the only reminder of the pinball machine is a solitary image which surfaced many years ago. By the time I had emerged from the womb, blinking in the harsh light of a world with only three TV channels, Zokko! had long since finished and it’s dire archival status meant I certainly wouldn’t be catching it anytime soon. It was regularly cited to me, though, as a show which deserved my attention. And it’s not hard to see why as, despite it having been barely written about, let alone viewed since 1970, the people who originally watched it still have such fond memories about the show. Many of these memories are a little dusty, so I decided it would be a good idea to grab a duster and polish these up, by which I mean: go to the BFI Archive. Naturally, with series one being completely lost to the ravages of BBC policies, I was unable to get a taste or flavour of this incarnation of the show aside from the aforementioned still of the pinball machine. Luckily, I gained access to the remaining footage of Zokko! and this provided me with the chance to view one of the real oddities of British children’s TV. Many people regard Zokko! as the inaugural entry in the vast lineage of Saturday morning children’s television. However, a few months before Zokko! aired, the same time slot had been home to Whoosh! starring Rick Jones, Dawn McDonald and Jonathan Collins; far from sharing the same genome as Saturday morning children’s TV, though, Whoosh! was a very different proposition. Rick Jones informs me that it was based in an imaginary central headquarters with pneumatic message delivery tubes everywhere. The series had a strong emphasis on comedy and the Radio Times listed Whoosh! as a place where anything can happen. Zokko! also appears to be a place where anything can happen, but it’s much more in touch with those later Saturday morning shows than Whoosh! And, despite the fact that Zokko! never aired on a Saturday morning (only early Saturday afternoons), I’m willing to overlook this as it’s a distillation of mostly everything which followed in its wake. Sure, it’s missing pop star phone-ins, competitions and puppet sidekicks, but it also contains DNA which is so readily associated with its kin: animations, music videos, guest performers and all linked together from the comfort of a central set. And the content which constitutes this now recognisable setup is an intriguing collection of short bursts of creativity and excitement. Short is easily the best word to describe the features contained within Zokko! as they fly by at such high speed it’s as if The Fast Show have commandeered Live and Kicking for a morning. Perhaps the world wasn’t ready for a three hour Saturday morning bonanza in the late 1960s, but it’s hardly a great loss as the relatively brief running time for features (they’re lucky if they stretch over a minute) allows Zokko! to have a zippy freshness not usually associated with children’s television from the same era. With the sedateness of its contemporary rivals challenged, is Zokko! just a hyperactive collection of visuals or is there some genuine worth in there? Well, after viewing the scant remnants of the show’s back catalogue, I can confirm that, yes, it’s an exhilarating ride overflowing with curious features. Naturally, I can’t comment on the first series, but I will say that the abstract skull which features on the pinball table is a chilling concoction and, coupled with that electronic droning voice, would make a fine Doctor Who villain, albeit one which was even less agile than those pepperpot Daleks. Moving onto the second series, the set is a good starting point to begin examining the essence of Zokko! as its bubbling, oversized test tubes and bright, wildly flashing lights are very much a visual representation of the series’ direction. It’s an outlook which is highly indebted to the experimental pop culture that it was born into and acts as an arresting spectacle that captures the attention. The content that follows, not surprisingly, isn’t the televisual equivalent of Tomorrow Never Knows and is, in fact, fairly traditional children’s entertainment, but it’s shot through with a comic flair and a unique packaging to differentiate it from any of its peers. Sure, the aerial acrobatics of The Sisters Inaros may feel a little bit too light entertainment, but this is counterbalanced by the superb silliness of The Hanco Bros who are a slapstick infused circus duo keen on tumbling toupees and cream pies. Likewise, the space politics of Skayn and big top crimes of Susan Starr (the longest sections at around two minutes) are much more mature than sketches such as the Indian snake charmer who struggles to charm his snake out of the basket without his turban or robe flying skywards. This combination of normality and absurdity could easily become bewildering, but here it plays out seamlessly and displays a fine understanding of the edit suite. The gags may be corny, but they’re married to quirky animations featuring kipper tie and flare wearing chaps (with barnets last seen on Rodney Bewes circa 1974) who lark around opening doors to reveal knock knock jokes, twizzling their moustaches or even just clambering all over the exclamation mark from the Zokko! logo. They’re brief, dispensable sections, but fit in with the fast paced ethos of the series and the animations are so indicative of the era that you can almost smell the Brut dabbed on to the animator’s neck. And the strongest clue to the show’s age comes in the music videos. These are no ordinary music videos, though, as they’re specially shot films for pop songs of the day. Georgie Fame’s infectious toe-tapper Get Away, for example, translates into a fairly literal video where a couple of hip, swinging kids jump in a convertible and escape the city folk for a day. And The New Vaudeville Band’s chirpy Finchley Central – awash with copious brass and whistling – again goes for the literal by filming a video in amongst the goings on at a London Underground station. They’re simple affairs, but much more imaginative than just pointing a camera at a miming, disinterested band and sum up exactly why Zokko! is such a unique show. Given the rich history of Saturday morning children’s TV which followed its wake, Zokko! deserves to be recognised as a landmark piece of British television for sowing the seeds which would germinate into such a long lasting legacy. Paul Ciani revisited the Zokko! format later in 1970 with Ed Stewart starring in Ed and Zed! on Saturday afternoons, but it would take a few years of tinkering until Tiswas and Swap Shop perfected the formula. Zokko! remains an exciting starting point and, like all the best stars of the 1960s, refused to rest on its laurels and, instead, pushed the genre forwards with its brave new vision.